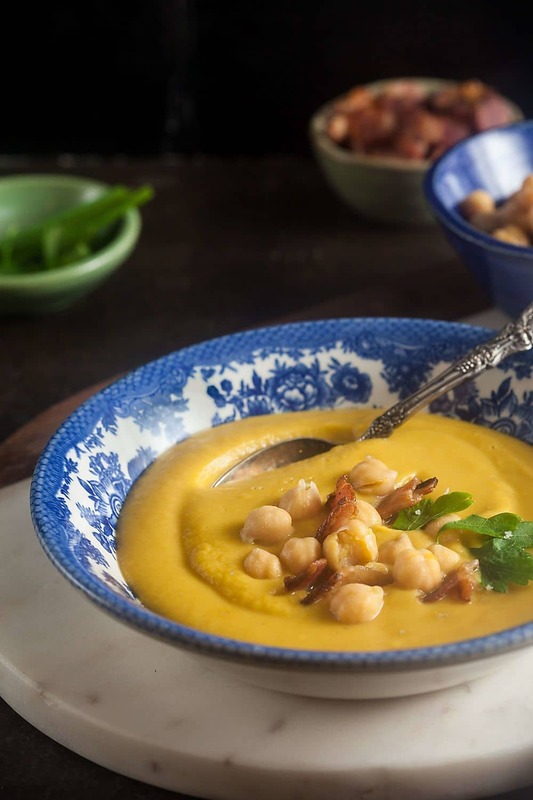 Creamy Chickpea Soup with Bacon and Fresh Herbs | Healthy. Delicious. This post is sponsored by Swanson®. All thoughts and opinions are my own. 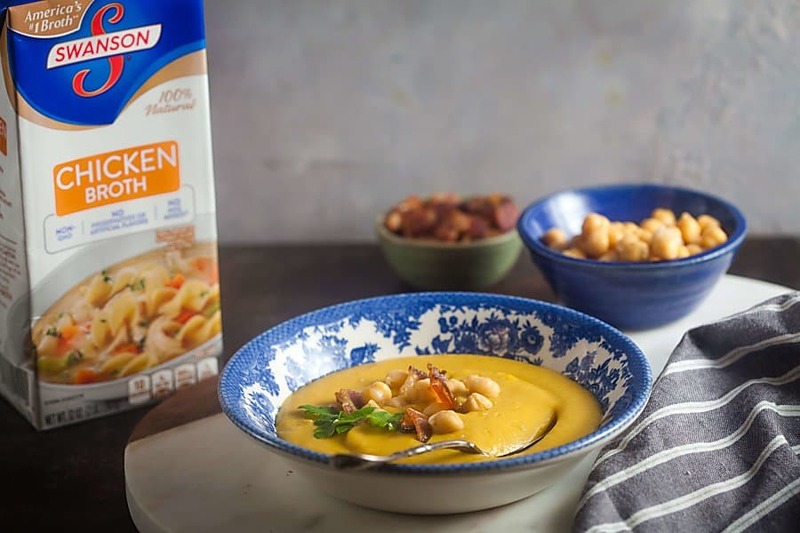 This creamy chickpea soup, made with Swanson® Chicken Broth and topped with crispy bacon and fresh herbs, is the perfect easy dinner for blustery winter nights. It’s snowing. Again. Maybe it was wishful thinking, but I really thought we were done with snow for the year. Luckily, I already had a warm, cozy soup planned for dinner. There’s just something about soup that makes winters in upstate New York a little more bearable. Especially when it’s as luscious as this creamy chickpea soup topped with fresh herbs and crispy bacon. This recipe is super easy to make and comes together in under a half hour. I especially love that it uses really simple, staple ingredients that I almost always have in my kitchen. 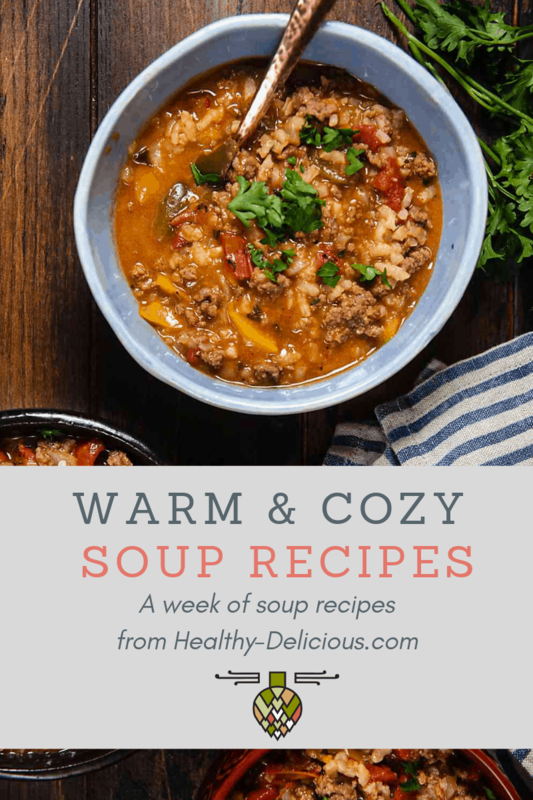 At it’s most basic, this soup is nothing more than mirepoix (a fancy word for onion, carrot, and celery), garlic, canned chickpeas, and a carton of Swanson® Chicken Broth. I love that their chicken broth is 100% natural, and it has a clean, balanced flavor that makes it no surprise it’s America’s #1 broth. 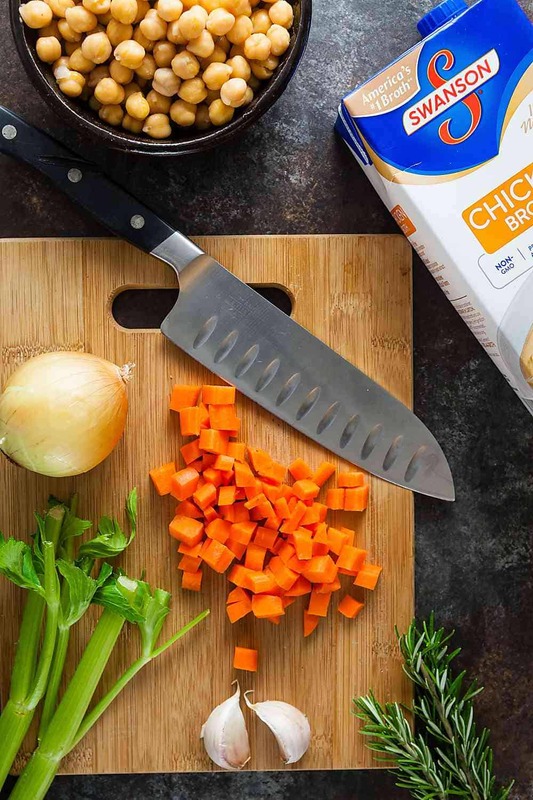 Besides using it as the base for quick soup recipes like this one, Swanson broth is great to have on hand for adding flavor to rice or poaching chicken for flautas. 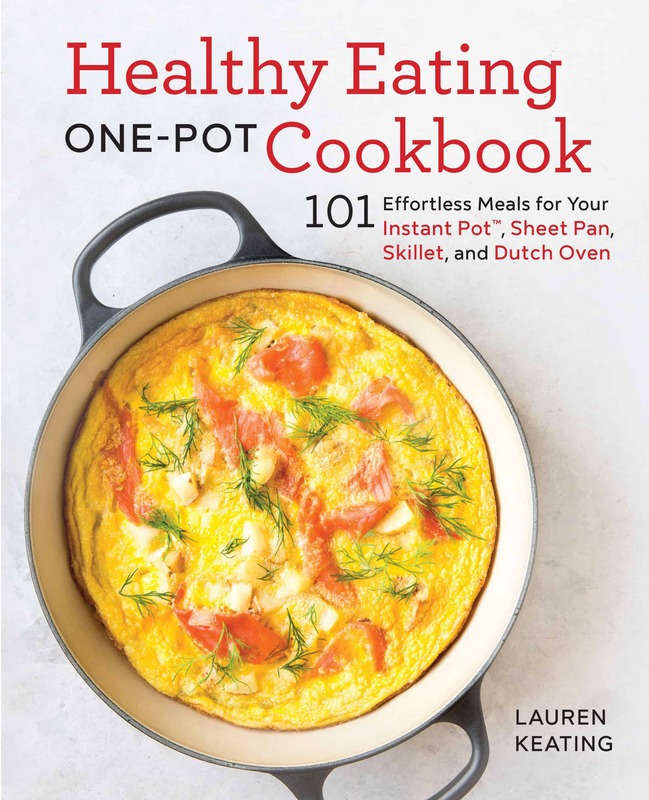 There are a ton of recipes on their web site, so be sure to check them out for inspiration! 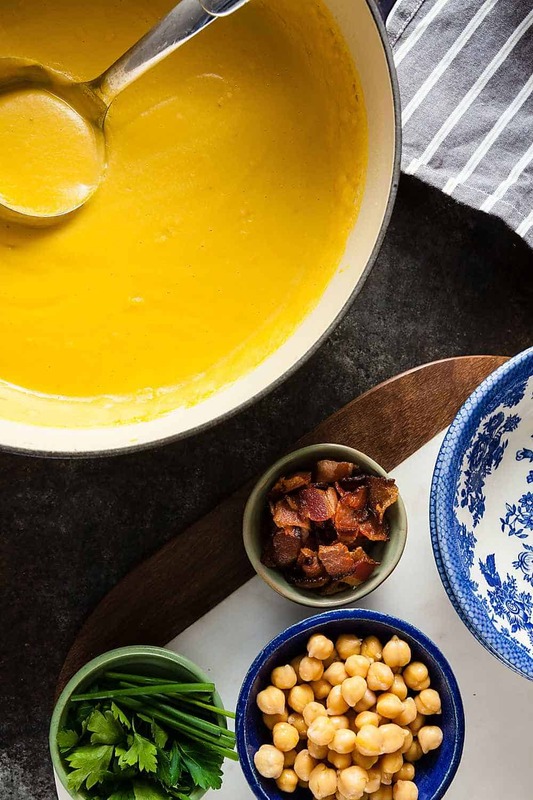 To make this creamy chickpea soup, start by sauteeing garlic and onion in a little olive oil until it’s fragrant. This is pretty much the best smell in the whole world if you ask me. Next, add diced carrot and celery and cook until the vegetables begin to soften. Then add the chicken stock, two cans of chickpeas, and a few sprigs of rosemary, and simmer everything until the vegetables are soft. While the soup simmers, fry a few slices of bacon until they’re nice and crisp and chop some fresh parsley and chives. Discard the rosemary and transfer everything else to a blender; puree until smooth and season with salt to taste. Top the soup with more chickpeas, the crispy bacon, and herbs. Rinse your chickpeas well and remove any loose skins. The skins can sometimes get gritty, so this will ensure a silky smooth puree. You don’t need to go crazy with this step, but taking an extra mixture to discard any that are already loose can make a huge difference. Use great quality chicken broth. When you make a recipe this simple, the quality of the ingredients that goes into it really matters – you’ll taste every single thing, so there’s no hiding. As mentioned above, I love the rich but clean flavor of Swanson® chicken broth. Don’t skimp on your toppings. The best part of pureed soups like this one is loading them up with toppings, right?! 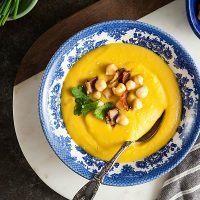 I love the contrast of crisp, smoky bacon with this chickpea soup. It only takes a little bit to give your bowl a rich, meaty flavor. I also like to add some whole chickpeas. You can use them straight from the can or, if you’re feeling extra fancy, roast them until they’re crispy. Finally, don’t forget to add fresh herbs – they add a light, fresh element and the soup just isn’t the same without them. Heat the olive oil in a large soup pot over medium heat. Add the garlic and onion and cook 304 minutes, until soft and fragrant. Add the carrots and celery and cook 5-7 minutes, until beginning to soften. Stir in all but 1/4 cup of the chickpeas and all of the chicken broth; add the whole sprigs of rosemary to the pot. Bring to a boil, then reduce the heat and simmer for 15-20 minutes, or until the vegetables are soft. While the soup cooks, cook the bacon in a skillet set over medium heat for 6-8 minutes, or until crisp. Drain on paper towels, then crumble. Transfer the soup to a blender, working in batches if needed. Blend 40-60 seconds, or until the soup is smooth. Return the soup to the pot and season to taste with salt and pepper. Serve the soup topped with crumbled bacon, fresh herbs, and reserved chickpeas. Lighten up Willa. Cook it very crisp and blot on paper towels or just leave it off. This sounds great, and it’s a creamy soup without cream. That’s what’s healthy. How is bacon considered healthy? Please explain. How is strictly restricting any single food from your diet considered healthy? Please explain. There’s nothing inherently bad about bacon when eaten in moderation. It’s less than half a slice of bacon per serving of soup; it adds flavor and texture with minimal nutritional impact. You can of course feel free to leave it out if you prefer.